Titus-Will and Berschauer Group, Inc. Break Ground on New Project in the Mottman Business Park Located in Tumwater, WA. Berschauer Group, Inc. has been hired as Design-Builder contractor for the new Titus-Will Service Center located in the Mottman Business Park opening in fall 2014. "I know the finished project will be exactly what we hoped for...Berschauer Group is acting as a true partner." Tad Orman General Manager of Titus-Will. Titus-Will Service Center, a new automobile detail and maintenance service center in the Mottman Business Park, will be the first project built at the 50 acre light industrial park in over 5 years. Berschauer Group, Inc. was hired last summer as Design-Build contractor and broke ground on the 12,000 square foot building in December. 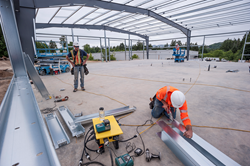 The building will be constructed using a pre-manufactured metal building system and will feature multiple apparatus bays, administrative offices, and associated site improvements. Project completion is scheduled for fall 2014. “Based on the outstanding work accomplished during the pre-construction phase, I know the finished project will be exactly what we hoped for,” said Tad Orme, General Manager of Titus-Will. “Berschauer Group is acting as a true partner with this project, guiding us through the permit process, assembling the Design-Build team and providing valuable feedback every step of the way.” Other project team members include Tovanni Hart, Architect; Hatton Godat Pantier, Civil Engineer; and PCS Structural, Structural Engineer. In addition to the Titus-Will project, Berschauer Group,, Inc. recently completed a seismic retrofit of the 3400 Building (the old Tyson Foods storage and distribution building in Mottman Industrial Park) for Thurston County Central Services. “Berschauer Group provided a compassionate approach to working with the owner and design team to bring the best possible outcome to meet the owner’s needs and budgets. Their work through all stages of the construction process is one of excellence and professionalism,” stated Rhonda Gillogly of Architects Rasmussen Triebelhorn, the project architect. Berschauer Group, Inc. has found considerable success with current construction and development projects including the recent completion of Aaron’s Furniture Store in Aberdeen and The Port of Kalama Administrative and Interpretive Center, a $4 million project, currently under construction. Berschauer Group, Inc. is led by Patrick and Regan Berschauer (co-founder and partners at Berschauer Phillips Construction Company from 1983 to 2012), his daughter Ashley Berschauer, and Asa Shigley. The company provides construction and development services for independent business, public agencies, developers, and investors in the commercial/retail, healthcare/medical, industrial, multi-family, and government sectors throughout the Pacific Northwest.